Special thanks to Justin Carrigan for a fabulous night at the recent Plant & Civil Engineer Awards ceremony – held at the Ramada Hotel, Belfast. 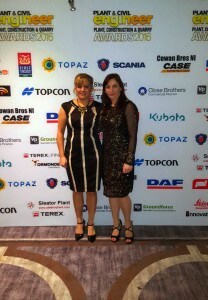 The night was very well organised, had great nominees, winners, speeches and was a very enjoyable evening overall. The awards provided an opportunity to network and entertain employees. This ceremony was attended by Catrina Quinn – Marketing Manager. We are delighted that Anaconda were selected as a finalist in the High Achiever of the Year Award.